Cooking is an art. A very delicate art, far superior and complex then the workings of sculpturing and painting. It takes a delicate hoof or claw to make something some delicious it assaults the taste buds with an explosion of senses that sends one into a blissful moment of pure joy. Its not easy to know what it takes to make a good dish, so the only way to find out is to practice. And what better way to practice, then with a contest!? Today was such a day for a contest. The sun was bright and the sky was clear. And so, in a clearing in Ponyvilles center, a large table was being set. Filled with all assortments of different ingredients. As well a number of small restaurants had been generous enough to even offer the use of their ovens by the contestants. Another table was set where a group of ponies and griffons sat, each wearing a sash with the word JUDGE written on it. And who were the cooks for this contest? Why no other then the cutest group of fillies one could see. "Fillies and gentlecolts! We are proud to give you the very firest Iron Pony Chef conest of Culinary Deliciousness!" Glimmer said, standing on the table with a stick as a pretend mic. "Who are you talking to?" Razor asked, looking to his sister worried. This town was doing weird things to her. Not to mention him. This place was not good for his health. "Them." Glimmer said, pointing to a few ponies who sat to watch the contest. A number of parents waving to their children. Razor rolled his eyes, "I don't know why I have to be a judge." Glimmer puffed her cheeks, "Well duh. Windy is in this contest. And as her friends we must give her the best support we can give. Plus Bebop and others are in and we have to do the same for them." Razor rolled his eyes, "Yeah. Yeah." Glimmer smirked and then leaned in to whisper to her brother, "And remember. You have to eat every bite. Otherwise you might hurt their feelings." Razor groaned, "I know. I know." He said and held his head. He still couldn't wrap his head around this, but when it came to his sister....she just knew how to get him into all kinds of things. Most of them never good. "While we get ready for the start, lets go and see who are contestants are." Glimmer said and flew over to the first filly she saw and held the stick out, like a interviewer would. Harlequin was pretty excited. 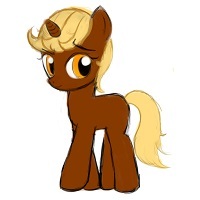 Here she was in some small, but quaint pony town called Ponyville, about to act as a judge for a cooking competition. She wasn't often awarded opportunities like this, though she went after them all the time. Cooking competitions were such a fine outlet and just so much fun... but every one she had ever entered hadn't exactly went swimmingly. After her third or so hospitalized judge, she no longer was allowed near most of the respectable contests. She wasn't the sort to let that deter her though! If they weren't going to let her enter a cooking competition, she could at least use her time to judge one, right? She was the future great celebrity chef of Equestria, after all. Using her fine, discerning palate for the cause of competition would only serve to help her build a foundation for her eventual empire of cuisine. Those were her thoughts when she applied to judge this Ponyville contest, at least... though she honestly wasn't sure they'd go for it. She was just your ordinary Manehattan waitress who had been expelled from culinary school after all; she still had a long way to go. She supposed it was because this was a competition for foals in a small town that they went ahead and said yes. She wasn't entirely sure. Either way, it was an opportunity... probably. If nothing else, it was sure to be a lot of fun seeing the fine talents of the next generation of young chefs! She was sure it'd be just delightful. Looking across the town square, Harlequin gave a nod. Preparations had begun and the contest was set to begin soon. She spotted the table for the judges and made a beeline for it. Taking her seat, she smiled at the other judge there already, a male griffon. "Hi there! You're a judge too? I'm Harlequin!" she started as she offered up a hoof to shake. It was a bright day in ponyville SugarSweet had found some time away from her candy shop in Canterlot and apon seeing a cooking contest going on it Ponyville she decided to sign up for it. SugarSweet always had a love for baking and cooking things and she was delighted to come out this day as a judge. The fact that the cooks where foals did worry her a little but she was happy to see what kind of talent in cooking these foals would show toady. Having just arrived in Ponyville Sugar trotted toward the center of town. Having reached the center of the small town Sugar spotted tables set up at which one of them she saw two other Judges. "Hello there all I'm SugarSweet!" She greeted the two trotting over to the table and taking her seat. Crown Jewel smiled brightly as she flipped through the old white-and-red-bound recipe book in her hooves, brown glasses perched on her nose, sitting on her flanks near the ingredient table. The little plum-maned filly had been on vacation with her parents in the quaint little town of Ponyville when she stumbled upon a flyer for a foals-only cooking competition being held in town. Normally, Jewel wouldn't have given it a second glance, but when her mom commented that any lady of Equestria worth her hayseeds would know how to cook for others, she signed up without delay. It didn't cross Jewel's mind until the day of the contest that she had no idea how to even properly crack an egg, much less cook a meal for somepony. Fortunately, Silver Lining never went anywhere without the family cookbook, which she was happy to let her daughter peruse for ideas and information. "Eggs Benecolt? Mmm... two poached eggs, eight strips of lightly fried hay-bacon..." She recited the recipe aloud, trying to figure out the terms as she went. Jewel was no stranger to a dictionary- a shield-mare of Equestria has to know how to speak nice, after all- but cooking terms were something new entirely. A little blue filly adorned in both an oversized white chef’s hat and apron cheerfully waved at the little griffon from where she stood. Wind Walker had no idea why she was here. Her little griffon friend Glimmer had written her a few days ago suggesting they spend some quality time together in Ponyville, which wasn’t such a bad idea, considering her mother, Write Stuff also had to visit the little farming village for some important R.E.A business! Somehow ‘quality time’ ended up being a cooking competition of some kind. And while her family were known for being strong guard and officer ponies, possessing the idea skills for an idea member of the Royal Equestrian Army, none of them were known for their cooking skills. “Mmm.”, she glanced down at the tools she was provided. Lots of little cups with measures on them. An assortment of ingredients she could cook with such as flour, sugar, oil and others. It was still rather early in the contest and a few of the sections marked off for the young chefs were still empty. For the moment, Wind would check out her competition and more importantly she would see what sort of cutie marks they had. So far she did not see any fillies or colts with specific ‘cooking’ or ‘baking’ marks, but that did not mean she was going to win this considering there were were bound to be a few more kids showing up soon. So she decided to study what she was going to cook. Being the brave sorts, she decided to simply close her eyes and jam her hoof into her cook book. Then she would open it up and would have to cook whatever the page turned to. This page has turned to something called ‘Omelette à la Norvégienne’. She wasn't sure what it meant, but the image in the book made it look yummy! Once her other supplies were dropped off, she carefully studied them. There was a bucket of vanilla ice cream which had been storied overnight in an mixing bowl. A package of white cake mix. One egg with a smiley face drawn on the shell. Some almond extract. A small container of already broken eggs which were just the whites. No yokes! And an container of tartar. The rest of the previously supplied ingredients would also play a part in this food-extravaganza! Now that she thought of it, she was like an conductor in a large symphony! For the moment she had to wait before the others showed up before she could cook. "So, is this your first 'Iron Pony Chef' contest? ", she asked Songheart. Moyokijani had been wanting to visit Ponyville for quite some time now. He had come into town the night before after a trek from Canterlot. His traveling bags hung lightly over his back as he been able to sell almost every bottle of tonic he had brought down from the Solstice Heights. This of course meant that had more than enough bits to rent a room for the night and be out and about the town early the next morning. It was during his morning excursion that he had seen an advertisement for a cooking contest that day. "A cooking contest eh? Sounds like somethin' I might just be able to learn a thing or two for doesn't it?" He mused to himself as he studied the paper to find the location of the contest. Moyo always loved learning about the various cultures and practices across Equestria and a cooking contest seemed just the thing to help with that. The zebra had felt quite honored to be selected as a judge. Those running the contest had evidently seen his slightly unusual tastes as something that would make the judging more interested. 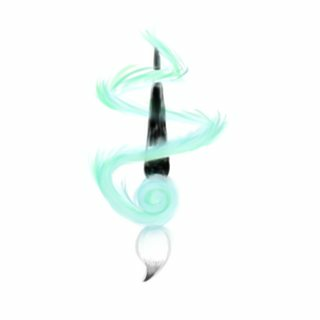 Before he knew it he had donned a sash stating his judge rank and was making his way towards a table near the center of the contest area. Two ponies and a griffon had already made it to the table. "Hello there all I'm SugarSweet!" He had caught the white pegasus' words as she made for her seat. The zebra trotted up and slid into the chair closest to one end. "Oh hello there SugarSweet, my name is Moyokijani... though I'm mostly called Moyo to my friends." He held out a hoof. "It's a pleasure to meet you." The zebra leaned forward to see the other two judges. "Looks like our contestants are already hard at work preparing to amaze us eh?" Sweetie Belle was SO EXCITED she could simply burst! A cooking competition! She bounced happily along with an excess of energy, her little saddlebags filled to overflowing with carefully gathered tools for creating culinary MASTERPIECES! She wondered how the competition was going to work. Were they going to get a secret ingredient? Were they going to make their favorite? She wasn't supposed to bring food, was she? She couldn't carry her cooking supplies AND her food! Oh, she hoped she hadn't forgotten everything! She signed in up front and got her little slip of paper with her table number on it, and wandered around the cooking hall. The tables were set a little bit high for her, so she had to keep hopping up onto her hind hooves and putting her forehooves on the table to see if this one matched her number! After several checks, she finally found the right one, and let out a little excited *squee*, tossing her saddlebags up onto the table! She just couldn't *wait*, but she didn't want to reveal her secrets just yet! So instead she looked over to the little blue filly at the next table! Oh gosh, she already had a cutie mark! And she looked so professional in her chef's hat and apron! Sweetie should have gotten some of those! But that was all right, she knew she was an awesome cook! This was going to be so fun! "Hi!" she chirped happily! "I'm Sweetie Belle! Isn't this so exciting? What do you think they're going to have us make? I just *know* this is gonna be fun! My parents say I'm a wonderful cook, I can't wait to show the judges! Do you think I'll get a cooking cutie mark from this, maybe? Oh, I hope so! That would be the best award ever!" "yeah, this is my first. i'm not the best chef in equestria but my mom's a pretty good cook and she taught me a few things" she replied to the blue filly. She looked at the ingrediants and tools. She was already thinking of what she would cook depending on what they would be doing. She lined the ingrediants up how she wanted them. With bases and acids on opposite sides with the ones that taste good together mixed with others facing eachother. "i wonder what we'll be doing." She said. She was thinking of hay straws for an appatizer if they were going to do that. Sweetie Belle leaned forward, looking past the blue filly to see another filly she didn't know past her. "Oh, hi!" she chirped happily to Song. "I'm Sweetie Belle! What's your name? Isn't this exciting?" she was still arranging her ingrediants when she heard a generally high pitched voice talk to her. "Yes, this is exiting! i'm Song Heart." she said. She recognized the name as the filly that her friend at school had told her about. "so you like to cook?" she asked jokingly. Crown Jewel looked up from her cookbook for a moment, her head swimming with a bunch of terms and descriptions that she didn't really understand- and being a homemade recipe book, it didn't have much in the way of pictures to guide her along. Though still psyched about the competition, Jewel was getting a little nervous about cooking for others now. Thankfully, a budding conversation between three other fillies nearby helped pull Jewel out of her thoughts and into social mode. She grinned widely, closed the book and stowed it in her purple saddle bag, and dashed towards the group. Mid-way there, she realized she had forgotten her grace and slowed to a careful trot, timing each step and focusing on her hooves so closely that she nearly trotted into the blue filly among them. "Hehe, sorry." Jewel apologized after managing to stop herself just a couple of inches short of bumping the chef-dressed filly off her hooves. She recovered quickly, and looked over the three with a bright smile. Even if this was a competition, that didn't mean she couldn't be nice to her competition; she was here more to cook for others than to win, anyway. "Hi! I'm Crown Jewel, what are your names?" “Oh nutbunnies.”, the little blue filly thought to herself as realized there was at least one pony far more skilled than she at this contest. While she was hardly a a baker, or actual frequent user of anything beyond a toaster, the Pegasus pony always enjoyed a contest, from trying her best to ‘beat’ her older siblings at her early morning cereal ‘race’, and then to the ‘See Who Can Clean Up The Most ‘Choco-Suga-Pony-Puffs’ from the floor, wall and daddy’’ contest that followed after the first. She did not like to lose! And cooking couldn’t possibly be hard! You just need to throw stuff in bowls, shake those bowls about and then toss them together before cooking them. This is going to be a cinch! She smiled over so politely back at Song Heart as she mind started to race. Then another little filly popped into view, this one’s named threw another wrench into her chances of winning this contest. ‘Sweetie Belle’, since pony names generally reflected one's skills, personality or both, Wind wondered if the 'sweet' was either based off her friendly personality or her ability to make 'sweet' foods. Her lack of a cutie mark did not help figuring out her special skill or talent either. This 'Sweetie Belle' also had praise from her parents, as opposed to being outright forbidden to use the real stove. The filly was only permitted to use the toaster and the little 'kiddie' oven that took forever to cook anything since it was powered by a rather weak light bulb. "I'm Wind Walker. ", the Pegasi politely replied back to the other fillies, "There sure are a lot of judges over there. ", she glanced over towards the growing amount of adults that were chatting amongst themselves. "Just hope more kids show up.". Wind would not be keen to finish three out of three. Glimmer giggled and retracted the stick, "Sorry. I think I need to work on my announcer role. I'm Glimmer and I'm your cute griffon announcer. Oh I can tell this will be fun. So do you think you will win?" Razor felt his eyes bulge as he saw the mare hold out her hoof. Towards him. "Too close, too close." He said as he backed up. His phobia kicking in. Of course he didn't see where he was backing up till he felt himself bump into somepony. He gulped and looked slowly behind. "AH!" he jumped away, "I.I...sorry. I.......I......I, you.....didn't see." He sputtered as he tried to get a coherent sentence out. He looked side to side. Two mares. Two girls! He was surrounded. 'Stay calm. Stay calm.' He thought, trying to take slow steady breathes. Why was he so scared of girls? He then spotted the zebra, and sighed in relief. Oh thank Faust. He was not going to be alone. 'Oh right....gotta regain the situation.' He thought and cleared his throat. "Uh...hi...I'm Razor." He said, put kept his distance as he could from the girls. Glimmer looked around at the other contestants and gasped when she saw Windy and immediately flew like a arrow from a bow and grabbed the filly into a flying hug. "Windy! I knew you would make it! Weeeeee!" She said as she spun them and squeezed with all her might. "Like it. I learned this from Pinkie Pie." She squeezed harder before letting her friend go. Glimmer gave a wave to Sweetie Belle and walked over to extend her claw. "Hello. I'm Glimmer." She waited for the filly to take her talon in her hoof. She didn't know this filly enough so she held in her excitement. So many new friends to make. And it was just so exciting. She wondered if anyone would make cake. "So do you all know what you all are going to make? Anything chocolaty?" Glimmer asked all the contestants. "Too close, too close. AH! I.I...sorry. I.......I......I, you.....didn't see. Uh...hi...I'm Razor." "Looks like our contestants are already hard at work preparing to amaze us eh?" The earth pony looked to see that another judge had arrived. He introduced himself to Sugar as Moyokijani and was a zebra stallion. She gave a cheery nod to his question. "Yep. Sure does. Gotta say I'm excited. What wonders do the culinary future of Equestria have in store for us?" "It's gonna be so much fun to try everything!" she added with excitement. "Oh hello there SugarSweet, my name is Moyokijani... though I'm mostly called Moyo to my friends." He held out a hoof. Razor gulped and tried to keep himself calm. So he had to sit next to two mares. He could do that...he would just keep his legs and wings really close. Make plenty of space between them and him. He could do this. "Uh....anyway uh...hi....I'm not really a food connoisseur but I know when somethings good. Though I'm mostly here because of somegriffon nagging me to be a judge." He said, casting a glance to his sis. There was an evil devious mind in that cute little head of hers, hidden under that purple bow. He looked at his watch and then looked to the other judges, "Look uh. The contest starts soon so...guess we just sit and wait then?" He didn't really know if that was the case, but he needed to sit...before he fell down. The excitement had really shaken him up a bit. So he sat at the judge table and waited, making sure he was at the edge of the right. That way only one pony would be near him. Glimmer felt so much joy. She was gonna get to see what everypony here made and she could already tell it was gonna be good. "Mmmm I can't wait. Make sure its really chocolaty." She said to Song. Glimmer looked and saw that it was time for the contest to start. "Oh!" She picked up her stick again and cleared her throat, "Oh and it looks like the battle of the dish is about to start. Who will take the gold!? Will it be Windy, the cute Pegasus with a kick or perhaps one of the other contestants. Stay tune and keep your eyes open!" She giggled, "How was that? I think I do good at this sort of thing." She laughed, "Well you all better get ready. I'll be flying around to give announcements. Don't be surprised now." She said before flying up and watching the cooks. Who would she watch first? Song made sure everything was where she could see it. Her mind was racing. Would there be specific things or categories that they had to cook? Hopefully not in deserts. She never really bothered learning deserts other then ones with chocolate in them. What kinds of chocolates did she have anyway? Milk it looked like. Let's see she could do a chocolate angel food cake for desert, but she should think about desert later. But she shouldn't be using up her thinking if there was a specific area in which she was supposed to cook. Gah, Why did she get herself into this again? "Just hope more kids show up." No sooner did Wind say those words did the doors of the building burst open and a little dark brown filly galloped in holding a really heavy looking saddlebag and panting silently but noticeably as she approached everypony. 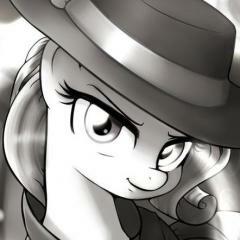 Slapping a note on the table of the judges, the little panting filly put her supplies down and caught her breath. On the note it said rather tersely, "Bebop Slide: Contestant. Sorry for being late. Slept in. Am I too late?" 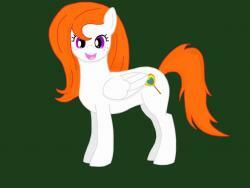 As soon as she caught her breath the little filly smiled and waved to some of the faces she recognized. She saw Glimmer, Wind Walker, and a few faces she hadn't talked to yet but recognized from class. taking her pencil in her teeth she began to write down and an introductory note to each of the participants. Upon each note it stated who she was and she wished them all luck. Sweetie Belle blinked as she had a stick in her face and a claw offered for shaking - but being in the same town as Pinkie Pie and Spike, this was hardly an unusual or even particularly strange occurrence. "Well, hello!" she said happily! As much as she wanted to make nice with all the other little foals, this was a grown-up, so she needed to be good! "Oh, I *hope* we get to make something chocolaty! I gotta wait till the judges tell us what to make and give us our ingredients! But if we get to do chocolate I'm going to make my special triple-chocolate fudge creme brule a la flambe! With chocolate chips!" Then she turned back to the fillies around her who were all being so wonderfully *friendly! * Even though some of them had their cutie marks already! "Oh, I love cooking! I'm Sweetie Belle, for those who didn't hear before! And I make breakfast for my mom and dad almost every weekend! My dad says my cajun-style veggie omlettes are better than any other cajun-style veggie omlettes he ever ate!" 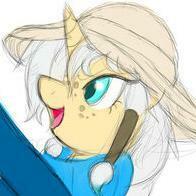 She blinked as she was handed a very nice little note from another unicorn, and smiled and let out a little *squee*. She pulled out her own little piece of paper, and a pencil, and took it in her mouth. She twisted the pencil up so she could tap it against her nose a couple times, then wrote down her name, and a "Good luck!" and she drew the best little four-leaf clover that she could! She gave it back to the nice unicorn who had given her the note! Wind Walker smiled as her old friend gave her a nearly Pinkie-Pie sized hug. The Pegasi did wonder why she sounded sort of like a squeaky dog toy when hugged hard enough, but for now, it was this contest she needed to concern herself about. "I'd be crazy to miss this, but what's the prize going to be? One million bits? A kiss from Soarin'? All the candy one can eat at 'Sugarcube Corner'? ", she glanced over at her own cooking books before turning her attention back to the little griffon as the little bird went into her 'announcer-mode', "Uh Glimmer, who the heck are you talking to? And you do know that you're talking into a stick, right? ", she couldn't help but smile. Causing her to smile even harder was the surprise visit from another pony she had known, this time it was Bebop Slide, a little unicorn filly she was friends with for almost as long as she knew the griffon. "Hey Bebby! ", she gave the girl a quick hug, "Don't worry about being a little on the late side as we're all starting to get ready. Oh, I'm not sure if you two have met before. ", she nodded at the griffon, "This here is my old pal Glimmer, and this is my slightly newer friend Bebop. Glimmer..Bebop...Bebop..Glimmer." The filly's face scrunched up as she overheard Sweetie Belle boast about her cooking abilities. She loved cooking? And her parents LIKED her cooking? Last time Wind Walker tried to cook up something, both her parents praised her meal, but suddenly both had to use the bathroom. She was very sure that neither of her parents swallowed what they had 'enjoyed'. This was it! She was going to be using her 'A-Game' today! This meal will be so awesome that it's gonna rock the judge's horseshoes off, and whatever Razor would wear. If he were wearing shoes. Jani sat at the judges table, happy to see what fillies and foals had shown up to show off their skills. He was already wondering what he would need to taste later. Chocolate? Caramel? Something salty? He only hoped it wouldn't be a lot of ingredients that didn't go together combined. If it was that, he would just have to stomach it. He had signed up for this after all and he didn't want to let the young ones down. The zebra looked over at the judges, a thoughtful expression on his face. "So, any guesses as to what we will be tasting? I hope it's something we can all enjoy..."
He continued watching the contestants get ready to start cooking. e was glad he had come into town on this day to take part in such a fun event! Razor normally considered himself a tough griffon....if one counted tough in liking to knit on the occasion, and enjoyed romance novels despite being absolutely terrified of being in close quarters with a female, and generally had a soft spot for cute things; especially kids. Why did his sister and little fillies have to give those eyes that simply demanded that you spoil them. He felt sure it was some sort of magical power and it simply was not fair. "I don't know what we eat...though I hope it is at least edible....and not deadly." He said, mostly to himself and softly so only the other judges heard. Glimmer looked at all the fillies getting ready to cook. Oh this was so exciting! "Huh? Oh them." Glimmer said, pointing to several passbyer ponies that stopped to watch the show. "Now do your best Windy. And don't worry, I'm sure whatever you make will be delicious." She said with a smile as she hugged her friend, "But don't think me and Razor play favorites. We do our jobs very seriously and treat each contestant equally." She looked around and took notice that now was the cooking time. Ingredients were all set to be gathered by the cooks and the ovens and such were ready. Naturally of course there were adults around to help with any sharp knives and such if they were needed. "Oh its time! Quick get what you need and cook till you drop!" She cheered before doing a backflip, "Let the cook off begin!" She shouted into her stick microphone. Glimmer wondered what everypony would make. "Hmmm. Cajun sounds good. I hope you make something like that." She said to Sweetie Belle as she moved around the work places. Sweetie Belle was admittedly a bit nervous. Despite all the friendly foals, she still wasn't entirely clear what the contest was going to entail! And then it was starting, and they hadn't even mentioned rles, or ... or a focus! Or what she was going to cook! Or ingredients! GULP. That must mean it was free-for-all! HER FAVORITE! And one of the judges was hoping she'd make some cajun food! Well, heck, she knew how to cook cajun-style! And they had amazing music with so much emotion and such rhythm! Well, she was going to have to cook food with just as much emotion and flavor to it! Her little hooves churned the ground as she raced from her table to the fridge. It was a great big metal door, and she had to stand on her hind hooves to reach the handle, but she could just barely make it! And she was the first filly there! She planted one hoof next to the door, gripped the handle in her teeth, and puullllllllllled! Wow, this door was heavy! With a hiss the door cracked open, mist washing out of the widening crack and spreading out along the floor before disappearing. A wave of cold came with the chill mist, making Sweetie shiver even as she kept pulling. She'd never seen a fridge door that was so heavy before! But finally it was far enough that she could move around to the inside, plant the top of her lil' head against the frosty inner door, and push it the rest of the way open. Only then did she look. And her lil' jaw dropped open in surprise. It wasn't a fridge! It was a whole ROOM that was full of frost and mist and ice, and it had SO MUCH FOOD in it! Every ingredient she could possibly imagine! Her eyes sparkled and a bright, magnificent grin spread across her face. "Oh my gosh! There's so many possibilities! What a TREASURE!" she cried, her lil' horn sparking briefly. She hurried and gathered a bunch of veggies and some eggs, carrying them back to her table, then went back to the cabinets to get spices and rice and a pouch of bread crumbs! She hurried back to jump up on top of her table and threw a bunch of pots onto the stove, turned on the gas, lit it with a spark from her horn, and started pouring water into the various pots. She started rice and water to boiling - with plenty of different types of oil added in for extra-exotic flavor! Grape oil and olive oil and sesame oil and sassafrass and syrup! It all looked good! A little too much salt, but that's OK, salty rice was good rice! Then she threw some spicy veggie sausages into a roasting pan and let that start up, before she set to with her little knife. Her hooves safely on the counter, perched up there happily, she hummed as her head bounced up and down as she reduced her fresh veggies to inevenly hacked chunks. This was so exciting! Her parents never let her use the knife! She was going to do such a good job!